An original e-novella based on the bestselling video game! Morbed is a thief and a survivor, and his skills in both roles are about to be put to the ultimate test. Joining together with a wizard, a druid, a necromancer, and a crusader, Morbed has arrived at a remote island to track down an elusive vagabond andreclaim valuable items pilfered from the city of Westmarch. But there is something loose on the island, something that has killed and is very close to killing again. In order to leave the island alive, Morbed will be forced to confront not only the terrifying creature that stalks the forests, but the darkest corners of his own spirit as well. One by one they set foot on the island, six weary souls battered for days by the storming Great Ocean. The sea was calm now and the shore was solid, but to Morbed it felt as though the ship still pitched and swayed beneath him. The sharp, salty breeze buffeted his ears and flapped strands of walnut hair over his pale blue eyes. He glanced farther down the beach, where the skeleton of some long-dead whale, each rib bone twice the height of a full-grown man, shone in the dull sunlight. With a shiver he lifted the hood of his wool capote. “Which way, fisherman?” Jaharra was the most restless of the band. Morbed mused that patience must not factor highly in the training of a sorceress—no, wizard, he corrected himself. Jaharra bore the title as a coat of arms. She huffed indignantly, haversack pushed to one side, eyebrows lifted, awaiting a response. Morbed’s thoughts wandered to the shapely figure beneath her mixture of cloth and plate vestments. Jaharra’s eyes caught Morbed’s. He wondered if she was capable of reading his mind, hoped she couldn’t, and quickly looked away to the fisherman. “How far?” the wizard asked. “Less than a day,” the peculiar man answered, scanning the woods as if expecting some howling army of savages to break from the tree line at any instant. His gaze flickered to Jaharra, whose own twinkling eyes burrowed into him, weighing and assessing. “Former thief. And I say the holy man should take a turn in front,” Morbed replied. Morbed and the druid turned to regard the hulking figure of the crusader, Clovis. The man stood like a fortress, girded for war. To his right side he held a thick wood-and-iron shield, more than half his height, which bore on its face the carved head of a mighty dragon. Massive, intricately crafted lion-mane spaulders flared from his shoulders. Tucked under his left arm was a great helm, and in that hand was a two-headed flail. The symbol of Clovis’s order, a design resembling a small upright pitchfork, was emblazoned on a tabard across his barrel chest. Excepting the fisherman, Clovis was the last to join their circle. For the flaxen-haired easterner, it was an alliance of convenience. For Morbed, it was also convenient—convenient that much of the ribbing normally leveled at him was now aimed at the crusader. Clovis gazed back at the two of them with quiet stoicism. Jaharra was set to respond, when a long, deafening peal shook the trees. The earsplitting tumult blared from the woods, rolled out over the water, and left a persistent ring in the air. It took several breaths for those gathered to recognize the sound as an outcry—the terrifying bellow of something perhaps primal and most certainly immense. Morbed’s hand instinctively hovered near the six-inch blade sheathed at his side. Morbed looked to the east. The sun was still climbing. Maybe . . . maybe there was time to reach the stronghold before nightfall. 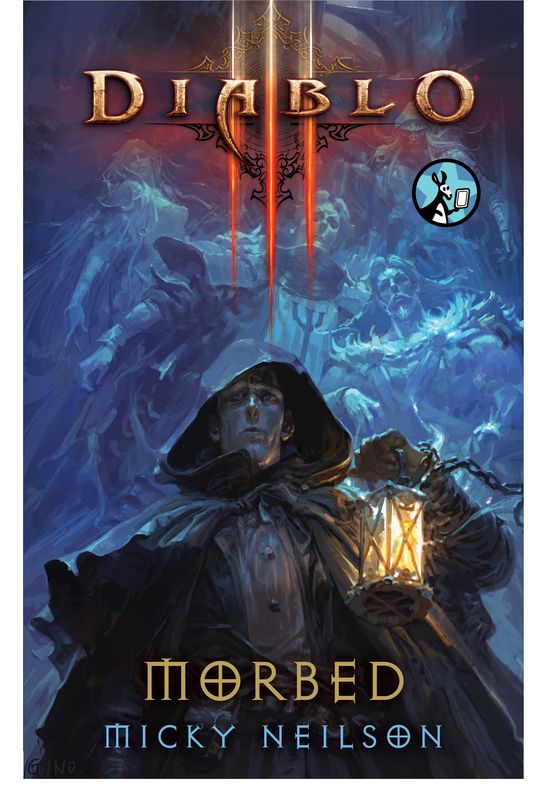 Morbed glanced toward the necromancer, Vorik. The gaunt figure stood alone, the ocean breeze whipping his sparse, silken hair. His eyes were closed as if he was in contemplation, and even from this distance Morbed could make out the bluish veins that traced his skin. Dark robes and bone-plate armor added little girth to the stooped, skeletal man. It was said that necromancers could raise corpses. Morbed often wondered just who had raised the necromancer. “There has been a great passing here. Many have expired and yet linger. This island is home to a host of restless dead,” Vorik warned. The sharp wind whistled through the dense jungle as the band pressed inland. Morbed looked ahead to the fisherman, then to the crusader. The holy man, while not altogether stealthy and despite his heavy armor, was remarkably light-footed. The only sounds had been those of the occasional small animals dashing through the brush or the needling buzz of insects. The creature had remained silent. Morbed’s eyes roved constantly. The druid, hiking on his right, seemed far more relaxed, although he scratched at his beard, a compulsive habit he displayed frequently. Morbed had wondered not long after their first meeting if the man had fleas nesting in the thick furs he wore over his leathers. Aedus drew a deep breath. “Ah, blackroot’s in bloom. Where I come from, they grow in dense patches resembling pools of dark water in moonlight.” Aedus’s tone was light, jovial, but his keen eyes remained vigilant, and his hand never strayed far from the long-toothed blade on his thigh. Morbed had been through enough harrying situations with Aedus to know that the druid was a stalwart fighter, regardless of his seemingly casual mien. He hadn’t been sure that he would like Aedus, Jaharra, or Vorik when their paths first joined. But fate had cast its lot, and slowly Morbed had grown fond of them, and, he hoped, they of him. There was distrust at the outset. Morbed, for the most part, shunned violence; he had spent his life as a wanderer and at times a thief and a grifter. But eventually his talents—lock picking, climbing, subterfuge, and especially the ability to recognize and take advantage of opportunity—had gained him the respect of his comrades. The fisherman looked back as if to reassure himself that the others still followed, his brows raised, eyes moist. Morbed frowned at him, and the older man’s head whipped forward once again. Morbed knew that their time together was finite. They would inevitably go their separate ways. And what of Morbed? He would survive. That was what he did best; that was, most simply, what he had always done. He was a survivor. In the distance a monolithic redoubt hunched atop a low, craggy peak, accessible via a winding, treacherous path that cut through stony foothills. “Aye,” the fisherman answered, rubbing his fingers as if he were invoking prayer beads. His voice was little more than a hush. “We’ll need to move quickly if we’re to reach it by nightfall,” said Morbed, setting off. They encountered the first corpse near the trailhead. Aedus had smelled it well before they laid eyes on the bloated form, still covered in leather and light armor, its skin the color of cream custard in some places, blackened in others, wedged in the crotch of two thick branches. It appeared to have been male. Large black flying insects busied themselves nesting in and feeding on the remains. Morbed knew that to a necromancer, life and death were more about an evening of scales—the Balance between light and dark, good and evil—than about mortality. Here some great calamity had tipped those scales. Without a word, the fisherman continued on. The others also departed. Casting a final glance at the putrefying corpse, Morbed followed. The trail was narrow and loosely paved with gravel. They passed two more corpses, dressed as the first, one lying in the center of the path and the other by the wayside, its left leg missing, presumably deposited somewhere in the rocks above. Both exhibited the same creamy, partially blackened pallor and had become hives of beetle activity. Movement of the insects under the cadavers’ skin made even Jaharra cringe. While the others scrutinized the bodies, Morbed observed the fisherman keeping his distance, back turned, scanning the forest anxiously. It seemed as though the seafarer purposefully avoided the corpses, and he appeared relieved when the party continued up the trail. The air had grown icier with the sun now hidden behind the mountain. Morbed’s legs protested with every step. The path doubled back, and after a few more strides, Morbed could make out above them a grand entry carved in stone. But where one would expect to find massive doors, he beheld only a gaping void. The curtain wall towered skyward, and from it small, squat bartizans loomed at each corner. The formidable, weatherworn stone face stretched outward, its span giving little indication of the fortress’s overall size. A long crimson standard hung over the former gates, billowing in the crisp wind. Upon it was a sigil: a cross with a curved line joining the vertical and horizontal, creating a closed loop on the top-right side. The stonework of the structure was uneven, and the entirety of it seemed to lean ever so slightly. As the leaders climbed the last stretch to the threshold, they spied missing chunks of mortar and stone from both sides of the aperture. Just beyond the path’s elbow, a vast, thick, timeworn door lay where it had fallen. Of its companion there was no sign. What struck them most acutely was the stench of decay flowing out of the musty, inscrutable depths. Jaharra and Clovis drew close. Morbed turned around to survey the forest below. The higher ground afforded a greater view of the woods, and Morbed now spied a swath of felled trees creating a path that led north and out of sight. The fisherman stood several steps away, eyes wide and darting to and fro, one hand over the other, knuckles white. As if in response, a great echoing cry rumbled across the dense woodland. A mounting dread tugged at the pit of Morbed’s stomach. Without a word, the necromancer passed the others and shambled through the doorway. “Best we go inside,” he announced unnecessarily. They stepped into a darkened, cavernous space. Morbed lowered his hood. The sun’s final rays, tinged a faint crimson, beamed dimly through upper windows but revealed little of the area below. Jaharra spoke words of magic and called forth a glowing orb. The enchanted light behaved in an unreal manner, seeming to illuminate beyond obstructions and around corners. It exposed a setting of utter disarray: furniture, mismatched bits of armor, weapons, trinkets, baubles, linens, baskets, tapestries, chests, a dusty loom, pieces of siege machinery, and all other form of miscellany. Staircases at either side of the entrance led to levels above, and several gloomy fireplaces huddled inside the stone walls. Just within the entry lay four bodies. Beetles scattered in the orb’s light. Three of the dead wore garments dissimilar to those adorning the corpses outside the walls: crimson cloaks and tabards over plate armor. The tabards bore the same sigil as that on the standard above the entryway. The fourth body had fallen near the three and was dressed as the outsiders had been. The rug beneath all was stained black with blood. “Our friend Clovis hasn’t heard the tale,” replied Aedus, kneeling. Aedus cast the stones onto the floor, whispering in a language Morbed could not understand. “Because I convinced the bandit king that I was the son of a wealthy merchant and could be ransomed for a hefty sum,” Morbed broke in. On the floor, the runes glowed. Clovis was turned away and seemed to be only half listening. But Morbed knew that the crusader had a way of appearing not to be aware when, in fact, he was taking account of every word. He recognized this because it was a talent he himself had perfected. What he wasn’t sure of was why the holy man behaved in such a way. Above the stones, ghostly moving images took on greater definition, finally assuming the forms of animals—spirit wolves that circled Aedus affectionately. The druid issued several commands in his strange language. The wolves obeyed, their hazy paws padding soundlessly over the tile floor as they dispersed. Two ascended the nearby stairs, two more loped ahead, and the last fell back to the entryway, walking in a tight circle before lying down, tail tucked, resting its muzzle on crossed forepaws. Jaharra adjusted her haversack. “Very well, then. Let’s keep moving.” With that, she strode deeper into the keep. All followed save Morbed, who stayed a moment, watching the ghostly guardian at the doorway. The thief did not answer but fell in with the others. They drove farther into the wide, open hall. At the far end, the floor dropped down to a lower level accessible via grand, deep stone steps. Jaharra descended, followed closely by the others. The fisherman’s attention was fixed ahead and to the right. He stared, lips parted slightly as if in anticipation. The glowing orb’s luminescence filled the antechamber, revealing another jumble of items. Vorik shambled diagonally across the massive room toward the northeastern corner, where a rounded section of wall indicated the base of a large tower. The orb’s light reached deeper, exposing an arched alcove next to the base, along with three more slain defenders and one more attacker. The alcove housed a great staircase that curved down around the tower base and out of sight. Although the stairs were wide enough to easily allow the passage of five men abreast, much of the masonry around the arch and along the wall and ceiling was dislodged, as if something too large for the space had forced its way through. Despite the cold, Morbed felt a bead of sweat trickle down his temple. The fisherman glared at the access with round eyes, pupils constricted. His hands were held tight across his stomach. Vorik stood at the edge of the stairs, peering down. “Whatever transpired here . . . the answers lie below,” the old man stated. Morbed kept pace with the wizard as they descended the winding stairs. After several spiraling turns, their path opened onto a large, long passageway. Jaharra gestured, and the glow from her orb illuminated the full length of the hall like water filling an aqueduct. The stench of death hung heavy even in the immense subterranean space. The explorers stepped around giant dislodged chunks of stone and passed small storage rooms filled with old furniture, linens, and tools, arriving finally at an intersection where the spokes of four hallways joined. Jaharra’s light spread to illuminate the corridors, each two and a half times the height of a human and five times as wide. Vorik stood staring down a corridor that ran opposite the tunnel ending under the great hall. This led deeper into the mountain. Massive hunks of masonry littered the path. Markings of forced passage were etched in the walls to the end of sight, where the corridor appeared to bend. “This way,” the necromancer rasped. Just then one of Aedus’s ghost wolves came trotting from the recesses of the hall that the group would have entered had they continued forward. “Then I will know the glory of righteous battle,” the crusader responded. Without saying as much, Morbed agreed. Since their meeting, the holy man had displayed a single-minded determination to find a means of vindicating his religion, a quest the warrior hoped might be realized in discovering the remains of Akarat, upon whose teachings the Zakarum Church was founded. For the crusader, it was more than just a mission to venerate his order’s patron; the Zakarum had long ago fallen to corruption, and Clovis believed that Akarat’s bones held within them an unassailable purity, capable of scouring the historical blight and restoring faith in the order. On the rare occasions when Clovis spoke, he said that if he found the bones, the world would see the Zakarum in a different light. Morbed had questioned early on if Clovis’s own faith had truly weathered years of scorn. Indeed, the more time he spent with the crusader, the more Morbed believed that the warrior’s faith was, in fact, unshakable. Then, too, there were the late nights during their recent voyage, while the others slept, when Morbed would tread softly to the galley and see Clovis seated alone, head bowed, eyes distant and forlorn over a brim-filled cup of cold tea. He often wondered what transpired in the mind of the holy man during those long, quiet moments. Clovis and his new pet set out. The wizard drove past the others, and the light moved with her. Jaharra and her companions rounded the bend. Before them stretched another long passage, and at its end were more bodies, a score of them heaped just outside the ruins of two massive iron-banded wooden doors. An open chamber lay beyond. In their approach the visitors crunched insects beneath their feet. Here in the depths of the stronghold, the smell of decay and putrefaction had thickened to become nearly overwhelming. Slowly Morbed and the others stepped over the fallen, all of whom, save two, wore the light armor of the harriers. The two defenders lay closest to the chamber entrance. The room itself was a grand, towering space. Niches in the walls housed statues of various horned aberrations, situated in a ring and posed as if holding court. Spaced between these, around the periphery, were large arched tunnels with wooden doors set deeper in, flanked by great stone braziers. The floor was starkly etched with a wide circle at the outer perimeter, intersecting lines and loops combining in the center to form an elaborate symbol. Higher up and stretched along the wall’s circumference were rusted chains, pinned to the mortar in various places, where skeletal remains hung from timeworn shackles, their bony frames held together by yellowed ligaments and ragged cloth. Jaharra’s light ascended the tower’s height farther, where the macabre display continued upward, circling them, grim skulls leering down in immortal condemnation. At the uppermost reaches of the tower, a rounded parapet jutted out, winged gargoyles looming at each side, mouths set as if in screams. “Or the bellows of giant beasts,” Jaharra offered. In his youth, Morbed thought. How many ages ago was that? When Vorik finished speaking, a pall of silence reigned. For a moment it seemed as though no one breathed. Morbed felt a draft and turned to the closest archway. The door set into the wall there was open. He quickly scanned the room, blurted, “The fisherman!” and tore off in pursuit.